This All-Weather has a 20-inch round barrel, 5-shot magazine, and adjustable buckhorn/bead sights. The metal surfaces are all hard chrome plated (except springs and sights), and a durable industrial-grade coating on hardwood furniture. 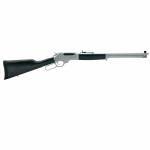 Barrel Length: 20" Barrel Type: Round Hard Chrome Plated Steel Rate of Twist: 1:10 Overall Length: 39" Weight: 7.00 lbs. Receiver Finish: Industrial Hard Chrome Satin Rear Sight: Semi-Buckhorn Front Sight: Brass Bead Stock Material: Hardwood ..
Henry Big Boy .45 Colt Lever Action Rifle. Drilled and tapped for easy scope mounting. Barrels are fitted with fully adjustable sights. 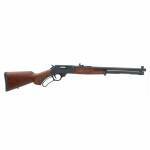 SPECIFICATIONS: Mfg Item Num: H006C Category: RIFLES Action :Lever Caliber :.45 Colt Barrel Length :20" octagonal with 1:38 rh twist Capacity :10+1 OAL :38.5" Weight :8.68 lbs Stock :Walnut Metal Finish :So..
the All-Weather version of our popular steel Big Boy, in .44 Magnum / .44 Special, and the same 20” round barrel. Noticeably lighter in heft than our hardened-brass Big Boys with octagon barrels, while offering the same adjustable sights, the same accuracy, the same magazine capacities, the same magazine tube loading feature, the same sling swivel studs, the same rifle-style fore-end cap, and the same non-slip solid rubber recoil pad. 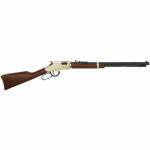 While it may sound like we’re just gilding the steel Big B..
Henry Classic Lever Action .22LR Rifle. Straight-grip American Walnut stock. Blued Barrel and lever. SPECIFICATIONS: Mfg Item Num: H001 Category: RIFLES Action :Lever Caliber :.22 S / L / LR Barrel Length :18-1/4" Capacity :15 Rounds.22LR / 17 Rounds .22L / 21 Rounds .22S OAL :36-1/2" Weight :5.25lbs Sights :Adjustable Rear, hooded front sight ..
One of our most appealing steel frame finishes, the colors come from a genuine case-hardening process on frame and rifle-style fore-end cap that sets these rifles apart from our other blued models, without the bright “Here I am!” of the brass and silver rifles. In the woods, where they’re right at home, the deep bluing, dark walnut, and mottled case colors form their own basic camouflage that your Great Grandpa would have been very familiar with while hunting deer or elk, and we like to think he..
Henry Golden Boy Lever 22 LR 20in 16+1 American Walnut Stk Blue. 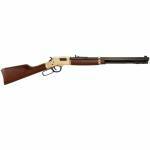 Features the famous smooth Henry action, Brasslite receiver, brass buttplate, 20" blued octagon barrel and Brasslite barrel band and American walnut stock. Fully adjustable buckhorn rear sight, beaded front sight. SPECIFICATIONS: Mfg Item Num: H004 Category: RIFLES Action :Lever ACtion Repeating Caliber :22 S / L / LR Barrel Length :20" Capac..
Henry H009 Classic Lever Action 30-30 WIN Rifle. Straight-grip American Walnut stock. Blued Steel Reciever. Drilled and tapped to accomodate a scope. Fully-adjustable Semi-Buckhorn sights. 5+1 Capacity. SPECIFICATIONS: Mfg Item Num: H009 Category: RIFLES CENTERFIRE Action :Lever Caliber :30-30 WIN Barrel Length :20" Capacity :5+1 OAL :39" Weight :8.3lbs Sights .. The pistol grip buttstock and steel capped forend are crafted from American Walnut with cut checkering for a sure grip. A soft rubber pad on the buttstock manages felt recoil. 18" Barrel, 4 round tublar magazine, Adjustable rear sight. 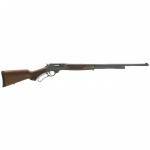 45-70 Government 18.4" barrel 4+1 capacity Standard Trigger Hammer Safety Overall Length: 39" 7.08 lbs American Walnut Stock Blued Metal Finish 1:20" twist Round barrel Sights: Semi-buckhorn rear, bead front, drilled/tapped .. Continuing on with our outside-the-box expansion program, we’re taking our lever actions in another new direction for Henry Repeating Arms with the introduction of the .410 bore shotgun. 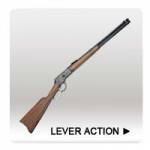 If you know our lever actions, you’ll be right at home with these new small-game-getters. There are times and places where a 20 or a 12 is just too much gun, and for those times and places the .410 may be the ideal way to go. Based on our blued steel-framed .45-70 Lever Action, with five-shot tube-loading magaz..
Henry Lever Action 17 HMR Octagon BBL rifle. The popular Henry Lever action is now available in a frontier version with a 20" octagonal barrel, fully adjustable semi buckhorn rear sight, beaded front sight and metal band. 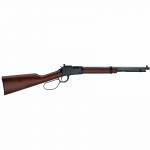 Features the famous smooth Henry action and wood stock. The receiver is already grooved to accommodate a scope. SPECIFICATIONS: Mfg Item Num: HNH001TV Category: RIFLES Action :Lever Caliber :17 HMR.. When you need distance and precision, Henry gives you a whole new hunt with the Long Ranger. Definitely not your Grandpa's Henry, the Long Ranger retains traditional lever action operation with exposed hammer and forged steel lever, but updates it with a geared action that drives a machined and chromed steel bolt with a 6-lug rotary head into a rear extension of the barrel for a strong and consistent lock-up from shot to shot to shot. 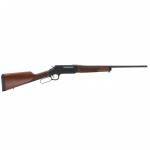 Its American walnut stock has a straight grip with cut checki..
Henry Small Game Lever Action .22 Carbine Rifle. SPECIFICATIONS: Mfg Item Num: H001TLP Category: RIFLES Action :Lever Caliber :.22 S / L / LR Barrel Length :16-1/4" Capacity :12 Rounds.22LR OAL :33-3/4" Weight :5.75lbs Sights :Fully adjustable Skinner Peep Sight and brass beaded front sight ..